In an age when the wellness industry is booming our drive towards so-called 'healthy eating' has never been more prevalent and our attitudes to food never more complicated. 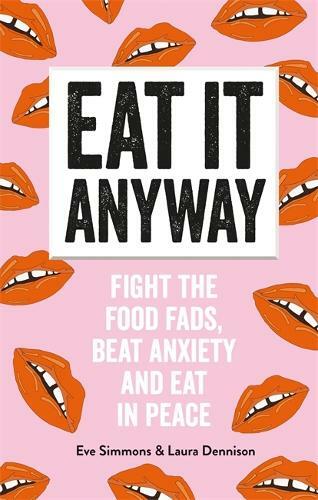 A refreshing and frank guide to reclaiming a pleasurable and stress-free relationship with food, Eat it Anyway is a welcome breath of fresh air. Here its authors, Eve Simmons and Laura Dennison, discuss the shared experiences that inspired the book and offer five, fool-proof tips to help you Eat it Anyway. Two and a half years a go, in a London branch of Pret a Manger, two women met to share stories of their most intimate relationships; the ones that had plagued their lives for years. It was a magical unison. Suddenly, neither was alone in their struggle. Said relationship was not a coercive partner but a lifetime of breakfasts, lunches and dinners. The enemy was in fact food. We - Laura and Eve - had suffered with eating disorders for the lion share of our young adulthood. In that moment, we decided enough was enough. But with recovery, the surrounding nutrition nonsense became disturbingly amplified. Adverts for ‘beach body protein powder’ or celebrities touting sugar-free diets shot through our brains like wildfire. The guilt gates flooded open, leaving space for restrictive urges to creep in. So, we launched a website. Notplantbased.com would be a nutrition-myth busting hub, food-loving hub for anyone who has ever worried about a morsel that passed their lips. We’d enlist dietary experts, scientists and doctors to separate the fact from fiction and help us peace with our favourite meals again. When we first started the blog, Laura admits that she hadn’t thought ahead to the countless numbers of people we could potentially help with our no nonsense approach to nutrition and by unashamedly telling our own stories with difficult eating. It’s now clear that we weren’t the only hungry souls seeking permission to eat everything. The blog grew in popularity and a couple of years later we have a real life book that we can hold in our hands, and that is currently being held in many vulnerable hands by people who just want to know that they are not alone, and that there is light at the end of the tunnel (we are living proof of that). Thousands upon thousands of our fol-lowers and readers have found freedom in our message of; eat what you want and stop worrying about it, and we’re so proud to created a book that can continue to help people heal for years to come, just like it helped us. Mammoth conversations with eating disorder experts have taught us that facing those deepest, darkest fears (Eve’s was pasta) is, unfortunately, essential for successful recovery. The number of times we misguidedly ordered a sad chicken salad - when we actually wanted the bacon burger - is too tragic to contemplate. It’s also a quick fire route to developing an unhealthy relationship with food steeped in guilt and anxiety. If you’ve spent your life avoiding pasta, I dare you to cook yourself a bowl of silken, steaming spaghetti for tonight’s dinner. After one mouthful, it will never again feel as scary. And you’ll realise that eating the odd bowl of Italy’s finest export will have no effect on your waistline whatsoever. Plus, it’s friggin’ delicious. Over the past ten thousand years, women have been continuously told by powerful figures that their worth is, in part, determined by their appearance. To add insult to injury, a bunch of white, rich men then proceeded to profit off this injustice via a capitalist beast known as ‘the diet industry’. As a result,, generations of women are pretty messed up about their bodies and what they put into them. How many times have your heard your mum or grandma berate themselves for an extra mince pie at Christmas or a (PERFECTLY NORMAL) new patch of cellulite? Now consider you’re a vulnerable, young girl trying to construct a healthy relationship with food in a world where Kim Kardashian sells you appetite suppressant lollies. However, there are a few magic women for whom nothing is off the table. They pile their plates high at Pizza Hut buffets and christen Fridays ‘cake day’. They are your people. I am lucky enough to have several in my life and they have propelled my recovery to levels beyond my imagination. They will remind you that you are well and truly worthy every one of your heart’s desires. If you find them, never let them go - and perhaps make sure your biscuit tin is always fully stocked. Sometimes when you are recovering from an eating disorder - because resources are limited within the NHS for sufferers - you can turn to the internet for things that will “fix” you in “6 weeks”. But eating disorders are physiological disorders, and they run far deeper than what is on your plate. It takes a lot of therapy, emotional healing and, in some extreme cases, re-feeding to be able to get yourself back to feeling healthy again. Like most good things in life, these things take time, and you won’t find your salva-tion over night. Focus on the little victories, take small steps and try to enjoy your healing process. There’s a difference between actually enjoying the process of cooking yourself or your friends and family a meal because it’s delicious and nourishing, rather than painstakingly weighing out your cereal because the extra calories terrify you. For lots of people with a difficult relationship with food, the kitchen can be a terrifying place where a lot of horrible memories live…but honestly, learning to cook for the love of it can help you to relax around food and alleviate those fears over time. Sign up to a local cooking class with a friend, or learn how to bake bread. Laugh at how your loaves are crooked and you burnt your pasta (who burns pasta?!). Life is to be enjoyed, and an enormous part of living is eating and cooking. Cooking can be social or even meditative, so get your apron on and start chopping those potatoes. There’s a real misconception that it’s “too late” to ask for help. Maybe you’re past the age that people “normally” have eating problems or you don’t think you look like you’re unwell enough. Stop and think: Is this becoming a problem that is controlling my life? If yes, you deserve to seek help.